I love looking through shops that sell plastic bowls and all sorts of other goodies. This is where I came across this set of drawers. I notice that more shops like Game also have little drawers that are the right size for your doll. 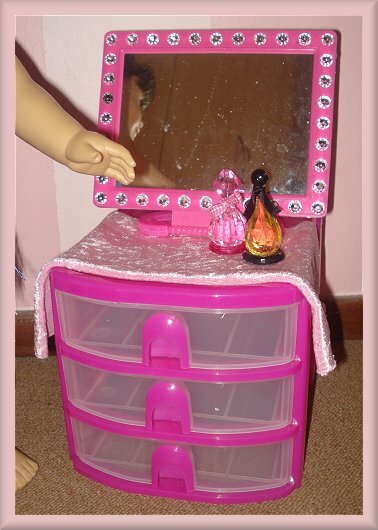 The mirror I found at a Crazy Store but is you look arouns you can easily find a small hand mirror to go with your drawers. I cut a piece of fabric for a cloth on my dressing table. 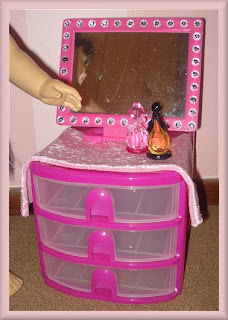 Once you put all the elements together you have a great addition for you dolls bedroom!